The green sludge is becoming powerful ammunition in Florida's election year. LAKE OKEECHOBEE — In Florida's midterm elections, draining the swamp has suddenly taken on a new and uncomfortable meaning. As waves of green continued to drift on the surface of Lake Okeechobee toward its eastern shores Wednesday, toxic algae congealed around boats at the Pahokee Marina and piled against the Port Mayaca Lock and Dam, increasingly consuming the oxygen in the water — and the air in statewide campaigns as candidates scramble to cast blame and promise change. "This is something that was totally avoidable," said Democratic gubernatorial candidate Jeff Greene, who chartered a red Bell 407 helicopter out of Palm Beach International Airport on Wednesday to view the lake from 400 feet. "You should send a picture to the people of Port St. Lucie. Headline: Coming soon to a river near you. Thank you, Governor Scott." Fed by heavy May rains, government inaction and a toxic combination of runoff from ranches, septic tanks and sugar farms, the green sludge — with a consistency often compared to guacamole — is becoming powerful ammunition in Florida's political food fight. It is threatening to kill fish, foul beaches and spoil tourist-driven economies for yet another summer, offering both parties a prop with which to bash their opponents for inaction and claim credit for recent efforts toward a solution. Already, the foul phenomenon has factored heavily in the U.S. Senate race between Republican Gov. Rick Scott and Democratic Sen. Bill Nelson. "Gov. Scott accomplished more for Lake Okeechobee and the surrounding communities in just over one year than Bill Nelson did in thirty years,'' boasted a press release from the Republican governor's campaign this week. Scott donned a baseball cap and hopped on a boat Monday for a tour of the Caloosahatchee River, then declared a state of emergency that will allow state regulators to waive various restrictions and regulations to store water south of the lake in an attempt to avoid the damaging discharges from the lake. Nelson, who conducted his own tour of the southwest Florida region last week, and other Democrats fired back. They labeled Scott an "election year environmentalist" who slashed funding for regulatory agencies tasked with cleaning the water, and famously banned phrases like "climate change" from the state Department of Environmental Protection. Why all the political finger-pointing? "It's because the Everglades is real important in Florida politics,'' said Manley Fuller, president of the Florida Wildlife Federation. "I don't think any statewide politician in Florida can afford not to be a big supporter of restoring the Everglades." What's harder to say is who will bear more of the blame: Scott or Nelson. "There aren't a lot of heroes in the Lake Okeechobee situation," said Rick Wilson, a Republican political strategist in Florida. "It's a really nightmarish problem that isn't going to go away." For more than a generation, half a dozen state and federal administrations from both parties have struggled to piece together a solution to clean and re-route the phosphorus-laden lake water and revive the wilted south end of the Everglades, struggling to survive largely on rainfall. For more than two decades it has been an exercise of fits and starts, but this year, as algae returned for a third summer in five years, the slow-moving federal government seemed to be responding with unprecedented speed. Last week the federal government said it would approve the use of $514 million in hurricane relief funds to strengthen the dike around the lake and accelerate its repair. On Monday, responding to political pressure from Florida's elected officials, the Army Corps said it would temporarily delay plans to release billions of gallons of water — and algae — into the St. Lucie and Caloosahatchee rivers, as needed each year to alleviate pressure on a leak-prone levee surrounding Lake Okeechobee. On Tuesday, the White House announced it had sent a funding package to the Senate that will allow the federal government to fund its share of the project, as one of a series of water projects to be authorized by Congress. And on Wednesday, the Army Corps of Engineers approved the $1.4 billion reservoir project funded by the state and federal government to store water south of Lake Okeechobee in future rain-soaked years, and avoid the need to release polluted water into the waterways along the east and west coasts. "A combination of these kind of things are going to help so that the Army Corps of Engineers doesn't have to release that nutrient-rich water which causes the algae blooms,'' Nelson said in a speech on the floor of the U.S. Senate Wednesday. Both Nelson and Scott took credit for the Army Corps' reaction and the potential funding, proposed as part of a broad state and federal project intended to restore the natural flows to the state's famed River of Grass. They have also accused the other of doing too little. On Tuesday, Scott's campaign dredged up a quote from when Nelson was state treasurer and insurance commissioner and promised "to save Lake Okeechobee and make polluters pay for the cleanup." Scott's campaign asked: "What does Nelson have to show for this pledge? 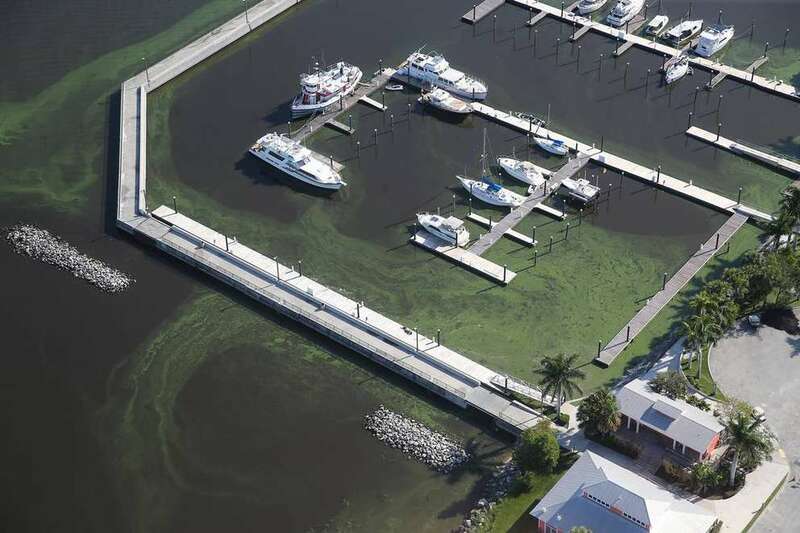 A federally operated dike that has yet to be repaired and another summer of algal blooms affecting families and job creators around Lake Okeechobee." But environmentalists blame Scott for siding with polluters and loosening Florida's water regulations. They point to legislation he signed in 2012 that repealed a state law mandating that septic tanks receive regular inspections to ensure they're not allowing untreated waste to seep into water bodies, like Lake Okeechobee, and they note that he reversed an effort to buy up sugar land to set it aside for Everglades restoration. Nelson, however, can't point to many victories he's had at the federal level. Since his election to the Senate in 2000, Nelson has grappled with the twin forces of slow-moving federal support and fading enthusiasm from the Florida Legislature. A bipartisan agreement struck between the state and federal governments just before the 2000 election promised to rescue the ailing Florida Everglades. But it soon faltered as the federal government delayed authorizing water infrastructure projects, and the Florida Legislature, under pressure from the sugar industry, postponed enforcement of strict pollution limits in the Everglades in 2003 until 2016. When that deadline came, the Legislature delayed it again another 20 years. During that time, Nelson has gone from being a member of the minority to the majority and back to the minority again, but his requests to Congress have been the same: fund, approve and accelerate the Everglades restoration projects. Last year, for the fourth time, Nelson introduced legislation that would automatically authorize the Army Corps of Engineers to move forward on any Everglades-restoration project that is ready to begin, without waiting for congressional approval. It didn't pass. In 2011, Nelson publicly commended Scott after the new governor proposed a state budget that restored some of the state's share of funding for restoration projects. Nelson also credited the bipartisan effort of the Florida congressional delegation, whose members have worked together to get spending bills passed to fund smaller segments of the project. But Nelson is among many Democrats who have relied on sugar-industry contributions for support and has been reluctant to embrace proposals vigorously opposed by the sugar industry. 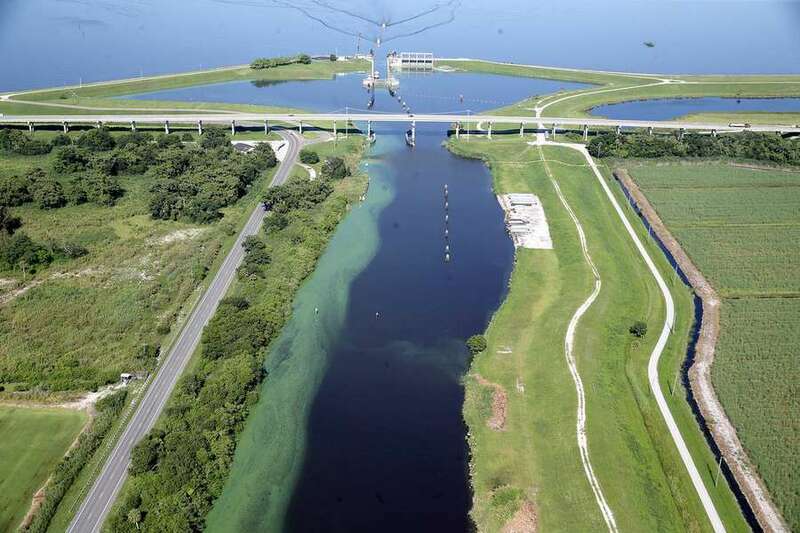 After the 2016 toxic algae outbreak that fouled both coasts, state Senate President Joe Negron called for the construction of a deep-water storage reservoir south of Lake Okeechobee to avoid toxic discharges into the St. Lucie and Caloosahatchee rivers. Sugar growers control about half of the 700,000-acre Everglades Agricultural Area and they have bitterly opposed selling large tracts of land, or ending their leases with the state, to make room for the reservoir. Nelson said Negron's reservoir idea had "merit" but didn't want it "viewed in isolation" from other restoration projects. For his part, Scott has also aligned himself closely with the agenda of the sugar industry, a long-time campaign donor, a power broker in Tallahassee and a key employer for some of the state's poorest agricultural communities. Four months into office, Scott petitioned the federal Environmental Protection Agency to rescind its Clean Water Act rule relating to excess nutrients in Florida waterways. He then slashed funding and regulations at the state's water management districts and the Florida Department of Environmental Protection, prompting hundreds of layoffs and a 65 percent reduction in DEP enforcement cases in the first two years. St. Lucie County Commissioner Chris Dzadovsky said last week there is a direct correlation between Scott's push to cut millions in property taxes that finance water management districts and a lack of state oversight that has resulted in "an increase in phosphorus and other contaminants in our waterways." "He hobbled the agency's ability to do enforcement and continue its regulatory work," said Aliki Moncrief, of the Florida League of Conservation Voters Action Fund. The state of emergency Scott announced this week was the second one he has ordered for the same problem. In 2016, toxic algae prompted Scott to declare a 100-day state of emergency along Florida's Treasure Coast and led state Senate President Negron to call for the construction of the deep-water storage reservoir south of the lake. Instead of shepherding the reservoir approach, however, Scott has focused on fast-tracking repairs to the leaking and aged Herbert Hoover Dike, which if it fails could devastate communities throughout the region. Scott has made repeated calls on Congress and the president to fund the dike repairs by 2022, instead of 2025. Nelson and Florida's congressional delegation have also urged the federal government to fund the dike repairs but, in contrast to Scott, his press releases also credit Republican U.S. Sen. Marco Rubio for seeking the additional funding to speed up work on the dike. After the White House announced it would support the reservoir project Tuesday, Rubio credited Negron for spearheading the initiative, saying that "coupled with existing efforts, (it) will greatly reduce the harmful Lake Okeechobee discharges once again threatening our coastal communities." Rubio didn't mention Scott. Negron, who was vilified by the sugar industry and its lobbyists for calling for a larger, 60,000-acre reservoir, said he believes the credit goes to the people of the coastal communities who, after 18 years of talk about a southern reservoir demanded action. "The citizens of Florida have made it clear they want us to take care of the environment and they don't want us to pollute estuaries and rivers with poisonous guacamole,'' Negron said. "The construction of the southern reservoir is now inevitable." 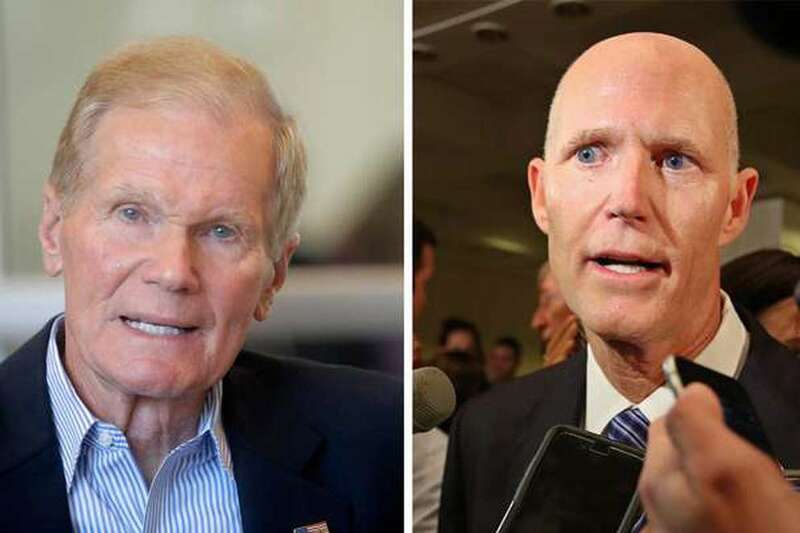 Nelson and environmentalists have also criticized Scott and the state Legislature for failing to use money approved by voters in 2014 for land acquisition purchases and conservation, including Everglades restoration. For three years, lawmakers diverted dollars intended for the Land Acquisition Trust Fund to finance other budget needs, such as agency operations and employee salaries. Nelson has declined to join Democrats from other states and support legislation backed by environmentalists called the Sugar Policy Modernization Act. The proposal would impose some market forces on the sugar industry by making import quotas more flexible and protecting taxpayers from government-funded buyouts of surplus sugar. Environmentalists say the artificial supports provided to the sugar industry in the 2018 Farm Bill encourage mass production of sugarcane in the Everglades Agricultural Area.